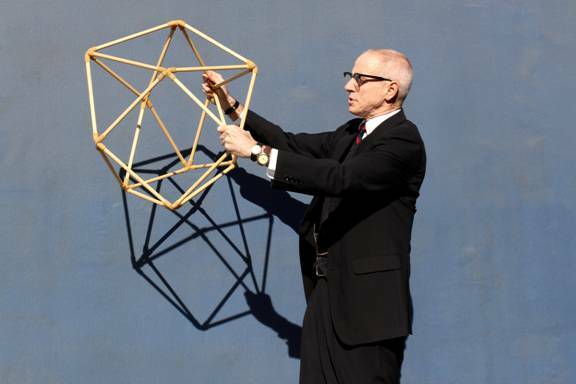 SAN JOSÉ, CA – In an exclusive interview with DOUG W. JACOBS, the Playwright/Director of San José Rep’s new one-man show based on the life of R. Buckminster Fuller, the author talks with CULTURAL WORLD BILINGUAL ABOUT HIS PLAY. “It is based on many books," he says," originally, the material that I built on came from the transcripts of a documentary footage, published by ROBERT SNYDER, a documentary cinematographer and filmmaker who was Bucky’s daughter’s husband. Then I added a lot of material from other books Bucky's State gave me, and I transcribed something from other tapes. A few pages I rewrote, but 98 percent (of the play’s dialogue) is really based on Bucky’s lines. the more poetic his language, the less I changed it, and if I changed anything in the poetry, it was because there were two or three versions of what he wrote. I usually will pick up one, and stick to that version of the poem. So, I wrote his poetry word by word. The rest, is more or less dialogue added. " “The structure of the play is mine. I rearranged the play into a different dramatic structure to sort of tell a story. As for the title to the play, it came at a meeting with Bucky’s daughter. C.W.B. Did you ever meet Buckminster Fuller in person? “When I had seen him talk, he had reminded me of the testimony meetings that people do in church, So I thought I should do this sort of thing with Bucky, an incredible man giving his audience testimony about the 20th and the 21st Century. The play have a lot of ideas about “testimonies.” When it became a theatrical thing, I had two conversations with his daughter which were really keys. One before we did the Centennial. I asked her what kind of music he liked and I expected a very esoteric answer, but his daughter told me that his taste of music was not very high, that her father liked musical comedies and HARRY LAUGHTER, an old Scottish singer. Then I asked Allegra if Bucky could dance, or sing, and she said no. Her father loved to dance, but he couldn’t dance, and when he sang he sounded like a horn because he did not a sense of pitch, but that in his heart, he wanted to be a song and dance man. That was one on my clues, because there was this great mind, and what he really wanted was to be a 1920’s song and dance man. I knew he grew up in the “Jazz Era,” so I understood why." 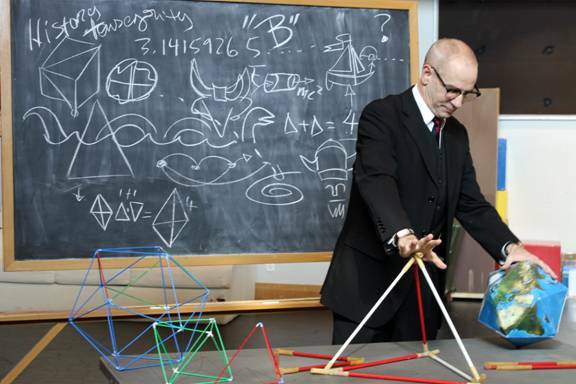 Actor RON CAMPBELL as Buckminster Fuller “Bucky"
Born in July 12 , l895 in Milton, Massachusetts, Buckminster Fuller, the grandson of a Unitarian Minister and also a Unitarian, was a pioneer in thinking globally. He explored principles of energy and material efficiency in the fields of architecture, Engineer and design. He was an architect, a Systems theorist, an author, a designer, an inventor, a lecturer and a futurist. It is no wonder that he has been compared many times, to Leonardo Da Vinci. During his life, (he died in Los Angeles on July 1 l983 at the age of 87) Buckminster Fuller wrote over 30 books among them I seem to be a Verb (1970) where he wrote: “I live on Earth at present, and I don’t know what I am. I know that I am not a category, I am not a thing –a noun. I seem to be a verb, and evolutionary process –an integral function of the universe.” He also created some terms, one of them Ephemeralization, meaning doing more with less. He defined wealth in terms of knowledge as: "the technological ability to protect, nurture, support, and accommodate all growth needs of life.” He declared war obsolete, and “selfishness” as unnecessary and unrationalizable. And he really believed that all children are born geniuses, with a great power of observation. "They learn to talk, to walk, they learn to solve problems quickly,” He wrote, “but when we send them to school, they learn to solve other's problems, instead of their own, and when they get the answers, to those problems, they must be the answers that their teachers want.” The result is that, eventually, children end up losing their genius. C.W.B. Was it easy or difficult for you to direct your own play? D.I. "I have been directing plays for over twenty years. Directing a play is never easy, but this time I had in mind what I wanted. I kind of write with a certain approach, so as I was writing it, certain aspects of the staging were very clear to me, then I began to pull RON (his Actor) on, who seems to be very skilled and I began to assemble the pieces over that. 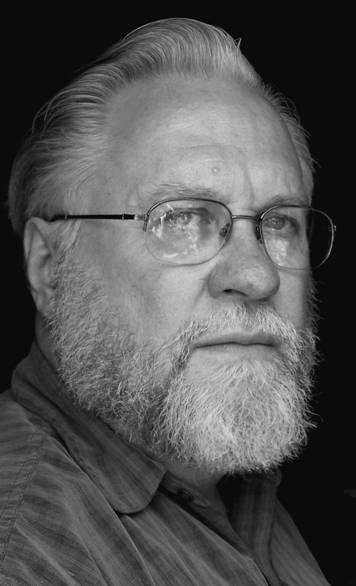 So, directing this piece became very natural process." C.W.B. Who do you think will be the audience for your play? D.J. “The audience to my play (before) has been much broader than I expected.” The play is for the young and old, for anybody who is curious about the world. There has been a broad appeal to this play, but whoever responds to it, needs to be curious, because Bucky was really an ordinary person, with extraordinary experiences. I designed this play with the purpose that everybody will find something in the play that they really will love. C.W.B. Is there something in particular that you would like the audience to know? D.J. "No. this play kind of explains itself. There are lots of documentaries that talk about Bucky’s inventions more comprehensibly than I do in my play. In my play I don’t talk about his inventions, I am more interested in showing how the real Bucky reinvented himself as a model for other people to reinvent their own lives. Bucky really believed that each person is uniquely designed for specific things. A lot of people are going to come out of this play talking about all these things that they should be doing with their lives but ended up not doing them. So, what the play does, is to make people think about their own lives."